Notes: This filter's unique feature is that different filter types are realized by injecting the audio signal at different points of the circuit. For this reason, the A-101-1 has three inputs with level control: one lowpass input which is normalized to the bandpass input, which itself is normalized to the highpass input. The level controls make it possible to mix the filters and to generate new filter types. e.g. with all three filter levels turned to maximum level you get a notch filter. Furthermore, the cutoff frequency influences which filter type is "monitored". This way you can blend from LP over BP to HP with increasing cutoff, known as "frequency scanning". Interesting effects happen when three different audio signals are used because they are both morphed and filtered at the same time. Vintage edition with black faceplate and custom knobs. Notes: A Low Pass Gate (LPG) can be a low pass filter, a VCA or a combination of both. This means both the harmonic content and volume can be controlled simultaneously which resembles the behaviour of many instruments: the louder, the more harmonics. The A-101-2's mode of operation is set with a switch: left position is low pass, right is VCA and the combo mode is in the centre. Alternatively, you can activate the modes with gate signals which is the reason for two gate inputs; this is very interesting in combination with clock dividers or trigger sequencers. The A-101-2 has an aggressive sound, compared to other LPGs and its resonance goes up to self-oscillation which not many LPGs offer. The oscillation is rather dirty and far from being a sine wave. 3U Eurorack module, 8HP wide, 50mm deep. Notes: Module A-101-3 is a 12-stage phase shifter with vactrols as phase shifting elements. Vactrols are known for their smooth sound behaviour. In contrast to other phaser designs, the A-101-3 is much more flexible and offering a lot of new features not available from other phasers on the market. 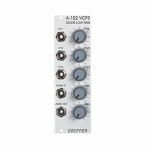 The main difference is that the Doepfer design offers access to each of the 12 input and output stages leading to a lot of new filters that cannot be obtained in other ways. Especially the free patchable feedback loops (yes, not only one feedback loop is possible) between each of the 12 stages, the separate phase shift control for the stages 1-6 and 7-12, and the 2 polarizers intended to control the feedback loops lead to completely new filter types (a polarizer is a circuit that is able to generate positive and negative amplifications in the range -1...0...+1 with -1 = inversion, 0 = full attenuation, +1 = unchanged signal, for details concerning the polarizer function please look at the A-133 VC Polarizer or A-138c Polarizing Mixer module). Internally, the module is made of 2 independent 6 stage phase shifters (1-6 reps. 7-12) with separate audio inputs (with attenuators), audio outputs (with mix control), and phase shift control units. The phase shift control units feature both manual and voltage-controlled phase shifting (e.g. from a LFO, ADSR, Random Voltage, Theremin CV, Foot Controller CV ...). For each sub-module a phase shift display (LED) is available. The LED shows the illumination state of the 6 vactrols of the sub-module in question as it is connected in series with the internal vactrol LEDs. Each of the 12 phase shift states is equipped with an audio output socket and feedback input socket to obtain full flexibility to create a multitude of different filters. The audio input signal and the output signals of stage 6 resp. stage 12 are mixed with 2 manual controls to obtain effects at two audio outputs (for normal phase shifting effect this is 50% input signal and 50% phase shifted signal). The two submodules are internally connected via normalized sockets so that two 6 stage phase shifters can be obtained without external patches. Audio output of stage 6 is normalized to audio input of stage 7 and CV input 1-6 is normalized to CV input 7-12. But due to the open structure of the module even other stages than stage 6 and stage 12 can be used as outputs to generate different sounds (simply patch the desired stage output to the normalized mix input socket). Notes: Module A-102 is a reproduction of the legendary low pass filter design that uses diodes in the filter stage as frequency controlling elements - resulting in "strange" resonance behaviour and frequency response, as resonance and frequency are not independent from another. Notes: Module A-103 is a voltage controlled low pass filter with 18dB/octave slope. The circuit is based on a modified transistor ladder (Moog ladder) and is a reproduction of the legendary TB303 filter. 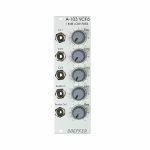 As for the rest the A-103 is identical to the A-120 Moog low pass filter (same controls, inputs/outputs) only the filter sound is different. Each filter has available a separate FM input as well as an Audio Input and Output. The FM input is typically connected to the output of the associated envelope generator (e.g. A-141-4). The envelope amount for all four filters is controlled by the FM knob and the CVFM input by means of four built-in VCAs, which are controlled by the FM control and CVFM input. This allows also voltage control of the envelope amounts. (e.g. from A-111-4) at the filter inputs. Even this parameter is voltage controllable as well as the resonance (Q). Application: polyphonic patches (four VCFs with same parameters). Notes: Module A-106-1 is a unique low/high pass filter and has its origin in Doepfer's experiments to build an MS20 filter clone. In contrast to other filter designs, it has different audio inputs for low and high pass, but only one audio output. The type of filter (12dB low pass, 6dB high pass or any mix) is defined by the shares of the audio signal fed to the corresponding inputs. Even two different audio signals can be used as low and high pass input. A special feature is the polarizer at the high pass input that allows to add/subtract the high pass to/from the low pass share, leading to pseudo band pass and notch responses. Another special feature is the clipping controls, which allow independent adjustment of the positive and negative clipping level. The resonance goes up to self-oscillation, but with a clearly different behaviour than on other filters. At certain resonance and clipping settings the self-oscillation generates rectangle or short sawtooth shaped pulses. In general, the A-106-1 is a very strange and awesome filter and far away from being perfect (e.g non-linear control scale, self-oscillation with all sorts of waveforms except sine, a lot of roaring, rattling, noise or other unpredictable sounds at high distortion and resonance settings, high distortion or audio level overrides the resonance, significant CV feedthrough). But the A-106-1 has a lot of character - probably much more than any other filter of the A-100 - and is able to generate filter sweeps which are not possible with any other filter. Notes: Module A-106-5 is a 12dB multimode filter that is based on the filter circuit of the Oberheim SEM module. The filter is equipped with a band pass output and a combined low/notch/high pass output. For this output a control knob defines the relation between low and high pass signal. If both signals appear at the same level (i.e. middle position of the Mix knob) one obtains a notch filter. Otherwise the low or high pass signal predominates. The module does not feature self oscillation in contrast to most of the other filters of the A-100 system. The module generates a distorted audio signal if the level control is set to about 50% (i.e. centre position) or more with A-100 standard signals like VCOs. Notes: Module A-106-6 is a multimode filter that is based on the filter circuit of the Oberheim Xpander. The module features 15 different filter types (those filters of the A-107 that were available in the Xpander) with 8 filters available simultaneously. The toggle switch Filter Group is used to switch between 2 filter groups. The module features voltage-controlled resonance. For filter group 2 (2L, 4L, 2B ...) even self-oscillation is possible. All standard VCF controls are available: manual filter frequency control Frq, one control voltage input with attenuator (FCV2) and one without attenuator (FCV1, ~ 1 V/octave). In addition, voltage-controlled resonance with manual control (Q) and a CV input with attenuator (QCV) are available. The circuit is based on a 24dB lowpass filter. The outputs of the four internal filter stages (i.e. the 6, 12, 18 and 24dB outputs) are mixed together with different levels and polarities to obtain 15 different filters. Because of this special circuit the outputs have slightly different levels and noise floor. This is caused by the different internal amplifications and numbers of stages that are required to generate the filter in question. If e.g. a filter is derived by one stage only (e.g. the 6 dB, 12dB, 18dB and 24dB low pass) the noise floor is smaller compared to a filter that is derived by a combination of all four filter stages. 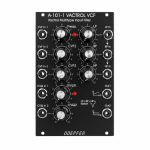 Notes: Module A-108 is a completely new voltage-controlled low pass filter based on the well-known transistor ladder (Moog ladder). The module has internally an 8-stage low pass filter with different slopes available: 6, 12, 18, 24, 30, 36, 42 and 48 dB per octave. In addition, it features a band pass output (i.e. band pass with transistor ladder). In the factory, the 4 low pass outputs of the A-108 are internally connected to the filter stages 6, 12, 24 and 48dB. Resonance (Emphasis or Q) can be adjusted manually right up to self-oscillation, in which case the filter will behave like a sine wave oscillator. The A-108 features an external feedback input that enables the insertion of additional modules into the feedback path (e.g. VCA for voltage-controlled resonance or phaser/frequency shifter for phase/frequency shifting effects). The socket is normalized and internally connected to the 48dB low pass output if no cable is inserted into the feedback socket. The frequency can be adjusted manually, or by voltage control. Three CV inputs (CV1, CV2, CV3) are available. CV2 and CV3 are equipped with attenuators. The filter audio input is very sensitive so that distortion - if desired - is possible even with normal A-100 levels (e.g. VCO output). Self-oscillation will break off at high distortion levels as the internal feedback signal is drown out by the distorted audio signal. This feature may intentionally be used to create new sounds. In combination with the Voltage Controlled Mixer A-135 and the Morphing Controller A-144 a filter with voltage-controlled slope can be realized (i.e. controlling the slope from 6dB to 48dB via CV). Notes: Module A-110-1 is a voltage-controlled oscillator. This VCO's frequency range is about eight octaves (ca. 15Hz ... 8kHz). It can produce four waveforms simultaneously: rectangle, sawtooth, triangle, and sine wave (triangle and sine shapes are not perfect, see remark below). The output levels are typically 8Vpp for saw and rectangle, and 10Vpp for triangle and sine. The frequency or pitch of the VCO is determined by the position of the octave (Range) switch and tuning (Tune) knob, and by the voltage present at the CV inputs. Frequency modulation (FM) of the VCO is therefore a possibility. Footage (the octave of the fundamental) is set by the Range control in five steps, and Fine tuning controlled by the Tune knob by about +/-1 one semitone (can be modified for a wider range). You can control the pulse width of the square wave either by hand, or by voltage control - Pulse Width Modulation or PWM. For more detailed information please look at the user's manual A110_man.pdf. In addition, the A-110 service manual is available as an example for the A-100 service manual that is available at extra charges. This document describes also how to modify the sensitivity of the tune control, how to re-adjust the 1V/octave scale and the frequency offset (i.e. the absolute pitch). Such modifications should be carried out by experienced users only! The core of the A-110-1 is a sawtooth oscillator (in contrast to the A-111-1, which is based on a triangle oscillator). The other waveforms are derived from the sawtooth by internal waveform converters. As the sawtooth reset (i.e. the back-to-zero slope) is not infinite fast but takes a little bit of time the derived waveforms triangle and sine are not perfect! At the top of the waveform they have a small glitch or notch that is caused by the sawtooth reset and cannot be eliminated by the waveform converters. The sine is derived from the triangle by a simple diode-based converter and the sine shape is not perfect (only a rounded triangle). If a perfect triangle is required, the A-111-1 is recommended. For a perfect sine wave the quadrature LFO/VCO A-143-9 is recommended. Notes: Module A-110-2 is a low-cost voltage-controlled oscillator. It's a slightly reduced version of the standard VCO A-110-1. Compared to the A-110-1, the A-110-2 has no sine output and the (expensive) octave rotary switch is replaced by a 3-position toggle switch. In return, the A-110-2 is equipped with an additional linear FM input and a soft sync input. A jumper is used to select the range of the tune control between about 1/2 octave and about 4 octaves. The width of the module is only 8 HP compared to the 10 HP of the A-110-1. All other features are essentially the same as for the A-110-1. The core of the A-110-2 is - like the A-110-1 - a sawtooth oscillator (in contrast to the A-111-1, which is based on a triangle oscillator). The other waveforms are derived from the sawtooth by waveform converters. As the sawtooth reset (i.e. the back-to-zero slope) is not infinitely fast but takes a little bit of time the triangle is not perfect! At the bottom of the waveform it has a small glitch or notch that is caused by the sawtooth reset and cannot be eliminated by the waveform converter. If a perfect triangle is required, the A-111-1 is recommended. The sawtooth output of the A-110-21 has a falling (or negative) slope. The front panel shows erroneously a rising (or positive) slope. This has no influence on the sound but becomes important when the module is used as an LFO or is mixed with the sawtooth output of another VCO. The control voltage applied to the socket 1V/Oct is added to the control voltage coming from the bus (interruptible by removing the jumper JP2). Connecting a cable to the socket 1V/Oct does not interrupt the bus CV connection! Notes: This analogue VCO is well versed in the art of deep and beautiful thru-zero frequency modulation, allowing the frequency to stop when CVs with 0V are applied, and even to go backwards when modulated with negative CVs. The term "quadrature" refers to simultaneously available sine and cosine waves at individual outputs. The VCO is sine based i.e. no waveshaping is used to derive the sine; for that reason, the sound is really clear and shows a minimum of distortion and overtones. The exponential section consists of the XTune control, the 1V/Oct input and the XFM input with the corresponding attenuator XFM. The exponential control voltage is the sum of these three voltages. The linear section consists of the LTune control and the LFM input with the corresponding attenuator LFM. The linear control voltage is the sum of these two voltages. The main advantage of the A-110-4 compared to other Thru Zero VCOs is that the design uses a sine/cosine core. The sine/cosine waves are not derived from other waveforms (e.g. sawtooth or triangle) by means of waveshaping. Rather the sine and cosine waves are the core of the VCO which results in very pure waves with a minimum of distortion and overtones. With it's both control possibilities, linear and exponential, as well as it's thru-zero ability, the VCO is perfectly suited for all types of FM applications. Notes: The Micro Precision VCO is a space-saving and utterly precise analog VCO/LFO with a extremely wide frequency range, immaculate tracking over at least ten octaves and nearly perfect waveforms. Basically, it's the same circuitry like the High-End VCO A-111-2 but with reduced functions and controls. It is suitable as a modulator for exact linear FM and much more. The XM potentiometer can be used as a fine tune control as long as nothing is patched to the XM socket. The oscillator has a frequency range of at least fifteen osctaves (0.0001 - 40 Hz in LFO mode; 0.5 Hz to 20 kHz in VCO mode) and offers perfect 1 V per octave tracking over ten octaves minimum, typically in the range of 20 Hz to 20 kHz. Frequencies below 25 Hz are visualized with a two-colour LED. The 1V per octave input is accompanied by two FM inputs, one for linear and one for exponential frequency modulation. A jumper determines whether the module obtains pitch CV via the internal bus. The VCO has a triangle core from which sawtooth, pulse and triangle are derived. The wave forms are almost perfect and sans glitches. The pulse width can be set with a control from 0 to 100% and of course it can be modulated. There is one input for oscillator synchronisation and its type, either hard or soft sync, is jumper-selected. Both types differ in sound with the hard sync being more aggressive and richer in harmonics. The Micro Precision VCO is a space-saving and utterly precise analog VCO/LFO with a extremely wide frequency range, immaculate tracking over at least ten octaves and nearly perfect waveforms. Notes: Module A-113 is a new sound source that derives four so-called subharmonics (German: Subharmonische) from an incoming pulse signal. The term subharmonics was introduced by Oskar Sala in connection with his so-called Mixtur-Trautonium. A subharmonic means in this context a sawtooth wave (German: Kippschwinger) whose frequency is derived from a master frequency and the master frequency is an integer multiple in the range of 1...24 of the subharmonic - in other words: the master frequency is divided by an integer 1...24 to obtain the subharmonic. The output waveform of a subharmonic is sawtooth (as also used in the original Trautonium) and not sine. The term subharmonics is somewhat misleading. The master frequency comes e.g. from an A-110 or A-111 to the frequency input of the A-113. The frequency dividers of the 4 subharmonics is adjusted with up/down buttons as displayed with two character LED displays. The subharmonics are available as single outputs and as mix output with adjustable levels for the subharmonics. Two gate type control inputs enable to select between 4 different mixtures, i.e. 4 different settings of the frequency dividers. In the original Trautonium these are controlled by foot switches to switch between 3 mixtures while playing (the original Trautonium has only 3 mixtures available but with the 2 gate inputs of the A-113 four different settings can be addressed). Additionally, the A-113 features a mixture memory with 50 presets. Each preset consists of 4 mixtures that can be selected with the gate inputs, each mixture contains the values of the 4 frequency dividers. Notes: Module A-116 provides voltage-controlled dynamic waveform modification of audio signals. It can produce new waveforms from the standard VCO shapes, and modulate these changes in real time. The signal first of all goes through an input amplifier, which can attenuate the signal as well as amplify it by up to a factor of 2. After the input amplifier, the signal goes through two parallel processors: a clipping circuit, and an asymmetrical amplifier. The processed signals are added together and sent to the output. Clipping-Level and Symmetry amounts are not just manually controllable, but can also be modulated by control voltages, to produce complex, constantly changing waveforms. Notes: Module A-117 (DNG) is a combination module, including a digital noise generator and an 808 source. The digital noise generator uses random sequences of square waves (18 step shift register with multiple feedback), whose rate can go from random clicks to noise. The colour of the noise is very different from the analogue noise produced by the A-118. The frequency range of the internal clock oscillator is about 100Hz - 100kHz. In addition to a manual setting, the rate can be controlled by an external clock - eg. VCO, high speed VCO of A-188-1/2, LFO or MIDI clock. The 808 Source aims to re-create the sort of multi-oscillator array that was used in Roland's TR-808 and 606 drum machines as the basis of the sound of the hi-hat, cymbals and cowbell. The cowbell mix uses two oscillators, and the cymbals mix six. Notes: Module A-121 is a voltage-controlled multi-mode filter with a cut-off slope of -12 dB / octave. Four simultaneous outputs are available, each with different characteristics: low-pass, band-pass, high-pass and notch (or band reject). The cut-off frequency determines the point at which the respective filter effects appear. The frequency can be adjusted manually, or by voltage control (Filter modulation, for instance by an LFO or ADSR). Two CV inputs are available, whose control voltages are summed. Resonance (Emphasis or Q) can be adjusted manually, or by voltage control, right up to self-oscillation, in which case it will behave like a sine wave oscillator. Technical notes: Module A-121-2 is the successor of the obsolete module A-121. But the circuitry is totally different from the A-121 which used the obsolete CEM3320 filter circuit. The sound of the new module A-121-2 is identical to filter of the Dark Energy II but has been expanded by the voltage-controlled resonance feature. Notes: Module A-122 is a voltage-controlled low-pass filter, which filters out the higher parts of the sound spectrum, and lets lower frequencies pass through. The cut-off frequency determines the point at which filtering takes effect. You can control this manually, or by voltage control (filter modulation, for instance by an LFO). Two CV inputs are available. The cut-off slope is -24 dB/octave. The circuitry uses a Curtis chip, and is very similar to the classic Oberheim filter sound. Because of its different circuitry and controls, the A-122 has a considerably different sound to the A-120 'Moog-like' filter, especially in the way the resonance behaves. Voltage controlled resonance: on the A-122, resonance can be controlled not just manually, but by voltages as well, right up to self-oscillation. In this case, the filter behaves like a sine wave oscillator. Module A-122 is a voltage-controlled low-pass filter, which filters out the higher parts of the sound spectrum, and lets lower frequencies pass through. Notes: A-123-2 is a voltage controlled high-pass filter with four filter outputs (6, 12, 18 and 24dB slope). It also features voltage control of the resonance. Notes: Module A-124 is a special 12dB multimode filter using the "strange" filter circuit of the "EDP Wasp" (an analog synthesizer with black/yellow case built end of the seventies, manufactured by the UK company "Electronic Dream Plant" with Chris Huggett und Adrian Wagner). This design "abuses" digital inverters as analog operational amplifiers leading to distortions and other "dirty" effects that generate the specific sound of this filter. The filter is equipped with a band pass output and a combined low/notch/high pass output. For this output a control knob defines the relation between low and high pass signal. If both signals appear at the same level (i.e. middle position of the Mix knob) one obtains a notch filter. Otherwise the low or high pass signal predominates. The module does not feature self-oscillation in contrast to most of the other filters of the A-100 system. The function and operation of this module is very similar to the module SEM VCF A-106-5. But the sound of both filters is very different! The only functional difference is the position of the sockets and controls, and the function of the controls CV2 (A-124: normal attenuator, A-106-5: polarizer). Notes: Module A-125 (VC Phaser) is a voltage controlled phase shifter. Phase shifting can be controlled either manually or by voltage control. Other parameters which can be controlled are resonance (governing the depth of the comb filtering, and tonal colour) and mix (the amount of the original signal which is added to the phase-shifted signal). The A-125 is used to generate the typical phaser sound ("jet sound"). Due to the voltage control feature not only the usual LFO-controlled phasings but even ADSR-, random-, sequencer- or S&H-controlled phasings are possible. In combination with the Shepard generator A-191 and several A-125 never ending barberpole phasing effects come true. The breakout module allows the separate use of each of the three A-127 filters. In addition, the filters can be patched parallel or serial. Especially the serial connection of three notches generates very complex phasing-like structures. For parallel filter connection the existing mixer of the main module may be used or an external mixer. For serial connection the filters are patched in the desired sequence at the breakout module. A jumper is used to define the filter type for each sub-unit for the mix unit of the main module. The breakout module can be used without modification only in combination with the new version of the A-127 (PCB printing "Version 4"). Only the new version has the expansion connector available, that is required to connect the breakout module without soldering. It's also possible to combine the breakout module with older versions of the A-127 (versions 1, 2 and 3) but in this case soldering is required to connect the breakout module to the main module (soldering 4 wires to each filter unit). 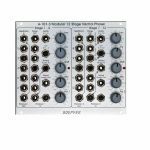 Notes: Module A-127 is a triple resonance filter unit. It contains three separate voltage-controlled band pass filters. Each filter has its own LFO (triangle waveform) with LED display and adjustable frequency and amplitude. Instead of the internal LFO an external control voltage may be used to control the filter frequency. In this case the external voltage is fed into the external CV jack (with integrated switch to turn off the LFO signal) and the amplitude control of the LFO affects the level of the external CV signal. Each filter is equipped with the following controls: LFO frequency, LFO/external CV amplitude, filter frequency, filter resonance and filter amplitude. In addition to the mix output for all three filters each filter has a separate audio output. The original audio signal can be added to the triple filter mix signal with a separate control. All 3 filters share a common audio input with attenuator. The filter audio inputs are very sensitive so that distortion may intentionally be used to create new sounds - if desired. The frequency control range of the bandpass filters is about 40Hz...6kHz, the frequency range of the LFO's is about 0.02Hz...20Hz (= 1 min ... 1/20 sec per cycle). Each of the three filters can used also as a 12dB low pass (with resonance control) instead of band pass. For this a jumper has to be changed on the filter board in question. In this case the module can be called no longer "resonance filter" but "triple low pass filter". It is also possible to modify only one or two of the filters to low pass. Notes: Module A-128 (Fixed Filter Bank) is a filter bank, made up of 15 parallel band pass filters, all with fixed middle frequencies and bandwidth (50 Hz / 75Hz / 110Hz / 150Hz / 220Hz / 350Hz / 500Hz / 750Hz / 1.1kHz / 1.6kHz / 2.2kHz / 3.6kHz / 5.2kHz / 7.5kHz / 11 kHz). Each band pass filter has its own amplitude control knob, with which that frequency band can be attenuated. The bandwidth of each of the filters is approximately half an octave. The signal at the output of the A-128 contains a mix of all the filters, depending on the position of each one's amplitude control knob. The filter bank's main job is to emphasise individual sections of the whole audio frequency range. Notes: The A-130 is a VCA with linear characteristic, thus primarily intended for controlling the level of CVs. It offers two signal inputs and an output with adjustable volume. Amplification is set with a Gain control and two modulation inputs. Not only control voltages can be used to "open" the VCA and to let the inputs pass through, there is also a manual gain control. This is pretty handy when you want to modulate the VCA with a bi-polar voltage - just turn up the gain half-way - this way you can use the CV's negative signal parts for closing the VCA. As the module has two signal inputs often you don't need a mixer before the VCA. Notes: Module A-132-1 (Dual Low Cost VCA) contains two voltage controlled amplifiers, with a linear response most suited to regulating the level of control voltages (ADSR amount, level of vibrato effect, etc). In non-critical situations, though, its VCAs can be used to control audio signals. Amplification is governed by the sum of the voltages patched into the two CV inputs. Notes: Module A-132-2 contains four linear VCAs with a common level control section for all four VCAs. The module can be used for all applications of simultaneous amplitude/level control of four different audio or CV signals. The module has a manual level control Amp. and two control voltage inputs CV1 and CV2 available. CV2 is equipped with a polarizer to adjust the effect and polarity of the external control voltage. The A-132-2 is equipped with an internal connector that can be used to normalize the four input sockets to other modules. So far only the quadrature LFO/VCO A-143-9 is equipped with a suitable matching connector. To connect the A-132-2 and the A-143-9 no soldering is required. A short 10 pin ribbon cable with removable connectors on both ends is used. For the normalling to other modules (e.g. Quad AD/LFO A-143-1, Quad ADSR A-143-2, Quad LFO A-143-3 or other modules with several outputs like VCOs or multimode VCFs) the second side of the ribbon cable has to be wired manually to the outputs of the module in question. The maximum manual amplification for each channel is about 1.5 (i.e. "Amp." control fully CW). With an external control voltage applied to CV2 the maximum amplification goes beyond 1.5 until the signal starts to clip. The maximum output level is about 20Vpp (i.e. the signal clips at about +10V and -10V). Notes: Module A-132-3 is composed of two identical voltage controlled amplifiers (VCA). Each VCA has a manual gain control and a control voltage input with attenuator. The character of the control scale can be switched to linear or exponential. All inputs and outputs are DC coupled. Consequently the VCAs can be used to process both audio and control voltages. The input has no attenuator available but is capable to process up to 16Vss signals (i.e. -8V...+8V) without distortion. Notes: Module A-132-4 contains four identical voltage controlled amplifiers (VCA) with exponential control scales. Each VCA has two control voltage inputs (C1, C2), a signal input (In) and a signal output (Out). The control voltage inputs C1 and the signal inputs can be normalled by means of internal jumpers, i.e. the corresponding input signals of unit #1 can be connected to the switching contacts of unit #2. Those of unit #2 can be normalled to unit #3 and those of unit #3 to unit #4. If the normalling is not desired the jumpers have to be removed. In addition the sum of all four outputs is available (bottom left socket with the sum sign). Therefore unit #4 has only one control voltage input (only C1, no C2). If desired this socket can be jumpered as control voltage input 2. But then the sum signal is no longer available as a socket (only as an internal pin). For each VCA output a jumper is available that determines if the output signal of the corresponding VCA is added to the sum signal. From the factory all four jumpers are set (i.e. all four VCA output signals are added). By removing of one or more of the jumpers one can choose which VCA output is added to the sum. The jumpers can be replaced by switches too. The control scale for each VCA is about 12dB/V (i.e. 1 V CV decrease corresponds to 12dB level decrease and 1 V CV increase corresponds to 12dB level increase). 0V CV corresponds to about -60dB (i.e. about attenuation by 1000). +5V CV corresponds to about 0dB (i.e. no attenuation or amplification = 1). The full attenuation/amplification range is about -90dB ... + 20dB. Attenuations below -60dB require a negative control voltage, amplifications beyond 0dB require a control voltage more than +5V. For the first CV input of each unit (CV1) an internal trimming potentiometer (attenuator) is available to adjust the control scale for other voltage ranges (e.g. 0...+8V for A-140 envelope control or 0...+10V for external 10V control voltages). To obtain another CV scale even for CV2 an attenuator (e.g. A-183-1) can be used. If an amplification offset is required (e.g. 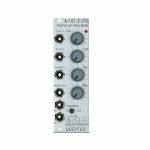 for zero-symmetrical control voltages like LFO) an external offset generator with attenuator/polarizer (e.g. A-183-2) is recommended. The A-132-4 uses a circuit with four exponential VCAs (SSM2164/V2164). Unfortunately there is no easy way to obtain a linear scale for the VCAs (actually two exponential VCAs are required to obtain a linear VCA, that's how e.g. the A-132-1 and A-132-3 work). Notes: A-133 is a special dual voltage controlled amplifier that enables both positive and negative amplifications. Negative amplification means in this context that the signal is inverted. The main application of the module is the processing of control voltages, e.g. ADSR or LFO but the module can be used also for audio applications (e.g. as a waveshaper, see patch examples below). The amplification range is about -2.5....0....+2.5 (other amplification ranges for small additional charges, e.g. -1...+1 or -5...+5). Amplification can be adjusted manually (Man control) and by an external control voltage with attenuator (CV). The present amplification is displayed with two LEDs: one for positive and one for negative amplifications (not a signal display but amplification display, similar to A-134). Notes: A-134-1 is a voltage controlled universal panning and/or crossfader module. If the module is used a voltage controlled Panning device one audio signal is panned to two different outputs. If the module is used a voltage controlled Crossfader two audio signals are mixed to one common output. The module enables even compositions of both functions. The module contains two linear high quality VCAs (made with CEM3381/PA381 until April 2013, SSM2164 from May 2013). VCA2 works in the opposite direction of VCA1 i.e. the more VCA1's loudness increases the more VCA2's loudness decreases. The panning or crossfading is adjusted with a control knob (manual control) and by two external control voltages, one equipped with an attenuator. Suitable control voltage sources are e.g. LFOs (A-145, A-146, A-147), envelope signals (A-140, A-141, A-142, A-119), random (A-118), Theremin (A-178) or a voltage coming from a MIDI-to-CV-Interface (A-190, A-191). The panning/crossfading is displayed with 2 LEDs. A-134-1 has an audio input with attenuator for each VCA. If the audio input of VCA2 is not used the audio input of VCA1 is connected with audio in of VCA 2, i.e. the sockets are "normalled". The module has three audio outputs: Left Output (VCA1), Right Output (VCA2) and Mix. For Panning applications the outputs Left Out and Right Out are used. If the module is used as a Crossfader the Mix Output functions as output. Module A-134-1 enables voltage controlled stereophonic panning effects (one audio signal distributed to two outputs), crossfading effects (two audio inputs mixed to one audio output with voltage controlled loudness proportion) and combinations of both effects. Notes: Module A-134-2 contains two identical voltage controlled crossfader units. Symmetrical mode: If the corresponding jumper is not set both VCAs of the crossfader have the same 50% amplification with zero CV. If the applied CV becomes positive the amplification of VCA1 decreases and those of VCA2 increases in the same way. A negative CV has the opposite result. The CV voltage range to obtain the maximum/minimum positions of the crossfader is about -2.5....+2.5V. This mode is useful for bidirectional (i.e. positive and negative) control voltages, for example LFO or joy stick (adjusted to 0V CV in centre position). Asymmetrical mode: If the corresponding jumper is set VCA2 is fully closed and VCA1 has full 100% amplification with zero CV. If the applied CV becomes positive the amplification of VCA1 decreases and those of VCA2 increases in the same way. The CV voltage range to obtain the maximum/minimum positions of the crossfader is about 0...+5V. A negative CV has no function in this mode. This mode is useful for unidirectional (i.e. only positive) control voltages, for example ADSR, ribbon controller or Theremin control voltage. The CV input of the upper unit (CV1) is normalled to the CV input of the lower unit (CV2). I.e. if no plug is inserted to CV2 the CV input of the upper unit (CV1) also controls the lower unit. The second signal input of the upper unit (In1B) is normalled to the first signal input of the lower unit (In2A). I.e. if no plug is inserted into In2A the signal In1B is used as the first signal input of the second unit. As the inputs and outputs are DC coupled the module can be used for both audio and control voltage signal processing. Notes: A-135-2 is a miniature version of the A-135-1. Behind a front panel with 8 HP only four linear VCAs (voltage controlled amplifiers) and a voltage controlled mixer based on the VCAs are available. - The signal input is not equipped with an attenuator. But the VCAs can process all signals up to 15Vpp / -7.5...+7.5V without clipping. In case of higher levels an external attenuator is required (e.g. A-183-1). - Selected output: the ouput if a VCA is removed from this sum signal when a plug is inserted into the corresponding VCA output. - Quad VCA: In this case the control unit of VCA1 (L1 + CV1) affects all four VCAs. The control units of VCA2, VCA3 and VCA4 are out of operation. In this mode the module has the same function as module A-132-2. That's why module A-132-2 will be discontinued. - Normalling of the signal inputs: by means of internal jumpers signal input 1 can be normalled to signal input 2, signal input 2 to signal input 3 and signal input 3 to signal input In 4. That way the same input signal can be distributed to four different channels by means of control voltages (e.g. quadrophonic distribution of audio signals). Suitable control voltage sources are e.g. A-144 (Morphing Controller) or A-143-9 (Quadrature LFO). Notes: Series A-135-4 contains several modules which are used to built a voltage controlled performance mixer. The modules of the A-135-4 series can be combined with the (non voltage controlled) mixer modules A-138o/p. A-135-4A is the main module. It is very similar to module A-138p, but with voltage control for all parameters (except gain). Also the front panels of A-135-4A and A-138p are very similar. The only difference are the additional LEDs which are used to display the magnitudes of all voltage controlled parameters. This is necessary because the positions of the manual controls do not necessarily correspond to the resulting parameter value because these are composed by both the manual controls and the applied external control voltages (via A-135-4B). Without LEDs one would be left in the dark in regard to the actual parameter value. A-135-4A contains four high quality voltage controlled amplifiers (VCA) for each channel: one for the main level, two for panorama left/right and one for aux. The control scales for all parameters are linear. Altogether 16 VCAs are included in the module. High end linear VCAs manufactured by Curtis/USA are used (CEM3381). The 16 LEDs display roughly the amplification of the VCA in question. Module A-138o is used as output module for the A-135-4A. A-135-4A and A-138p can be connected together to the same A-138o to obtain e.g. four fully voltage controlled channels (A-135-4A) and four manually controlled channels (A-138p). Each control voltage has an input socket and a polarizer control available (the polarizer function is described more detailed on the A-138c info page). That way it's possible to adjust the depth and polarity of the external control voltage which affects the parameter in question. If the same CV (e.g. LFO or ADSR) is used e.g. for two panorama control inputs the result may be the opposite if the polarizers are adjusted accordingly (i.e. one positive and the other negative). The external control voltage is added to the voltage that is generated by the manual control on the A-135-4A main module. The sum of both voltages is used to control the VCA in question and is displayed with the corresponding LED on the A-135-4A module. The picture on the left side below shows one channel of A-135-4A/B as block diagram. The mute CV input works in principle in the same way as the level CV input but with reverse polarity and higher sensitivity (about factor -2). Typically, the mute polarizer control is adjusted fully CW. Then a (gate) voltage of ~ +2.5V or more fully mutes the channel in question. If the mute function is not used the mute CV input can be used as a second CV input for level (with twice the sensitivity and inverted polarity compared to the normal level CV input). A-135-4A and A-135-4B are connected internally via a 20 pin ribbon cable. The cable can be longer so that the CV input module A-135-4B needs not to be mounted next to the main module A-135-4A (e.g. to the row above or below). Modules A-135-4A and A-135-4B are available only as a module combo because the single operation of each module does not make sense! Notes: Distortion/Waveshaper module for dynamic distortion of audio signals with extended settings. The applications of this module are waveform modifications and distortion like clipping and waveshaping of audio signals and control voltages (e.g. LFO). - Negative signal component with adjustable and voltage controllable clipping level "-L" and amplitude "-A"
- Positive signal component with adjustable and voltage controllable clipping level "+L" and amplitude "+A"
The amplitude parameters of both the positive and negative components can amplify in a positive or inverted fashion i.e. it can fold the signal. This creates additional harmonics and enriches the sound, creating very living sounds, especially when modulated by dynamic CVs. Notes: A-137 is a voltage controlled Wave Multiplier. The basic idea of a wave multiplier is to multiply the waveform of an incoming signal (e.g. triangle/saw/sine from a VCO) within one period of the waveform. This leads to additional harmonics of the incoming signal. The period and consequently the pitch of the signals remains unchanged (in contrast to frequency multiplication e.g. with the PLL module A-196). The A-137 works as a kind of "inverse low pass filter", i.e. it adds a lot of harmonics to a signal that contains none or only a few harmonics (e.g. sine or triangle waveform). In contrast to that a low pass filter (e.g. A-120) removes harmonics from a signal that contains a lot of harmonics (e.g. saw or rectangle waveform). Consequently the best results are obtained in combination with input signals poor in harmonics (e.g. sine or triangle). The A-137 can be used with signals rich in harmonics too (e.g. saw) but the effect is not as remarkable as for triangle or sine waves. For rectangle signals none or only little effects are obtained. The Multiples parameter (manual and ext. CV) defines the number of basic wave multiplications within one period. With the Folding Level and Symmetry parameter (both manual and ext. CV) the upper and lower clipping levels of the wave folder units are controlled. The Harmonics parameter (manual and ext. CV) adds some harmonic content by sharpening the waveform edges and adding overshoot peaks. It works a little bit like the resonance control of a VCF. The module is fully DC coupled, i.e. even control signal can be processed with the modules. Notes: Module A-137-2 is another version of a wave multiplier. In contrast to the A-137-1 Wave Multiplier I, the A-137-2 generates four phase-shifted copies of a VCO signal applied to the audio input. The four shifted signals are added to the original signal to obtain a fat sound similar to five independent VCOs. The phase shifting is made by a simple circuit that works only for sloped signals like sawtooth, triangle or sine, but not for rectangles or pulses. The audio input signal (typically a sawtooth, triangle or sine wave from a VCO) is compared with a slowly varying control voltage (CV Shift In). The output of the comparator is a rectangle wave with variable pulse width. When the output of the comparatur is added to the input signal (a sawtooth in the example) with the correct level relation between both signals one obtains a phase shifted sawtooth. The left picture shows the incoming sawtooth wave on top. The two horizontal dashed lines (blue and orange) indicate two different comparison levels. Below the incoming sawtooth the two resulting comparator outputs (rectangle waves) and the two resulting shifted sawtooth waves are shown. It is not a "real" phase shift but an algebraic function. But the result is virtually the same. One could obtain the same function even with several comparator modules A-167 and mixers A-138a/b or polarizing mixers A-138c. But this would require a lot of modules. The module has available four manual shift controls and four control voltage inputs with attenuators for the four internal shifting circuits. Typical sources for these inputs are LFOs, VCLFOs, random voltages, envelope generators, sequencers or other control voltage sources. Internally eight single outputs are available at single pins: the four shifted signals and in addition four rectangle outputs. A corresponding breakout module with eight sockets is in the planning stage and will be released provided that there are sufficient inquiries. The original signal and the four shifted signals are equipped with internal jumpers. If external toggle switches are used instead of the jumpers each of the 5 signals can be turned on/off individually. The audio input is equipped with an attenuator to adjust the level for the right summation of the original and the comparator signals (as described above). Notes: Module A-138c is a four channel mixer, that allows to add or to subtract four incoming voltages to the output signal. In the middle position of the corresponding control the amplification is zero. Turning the knob counter-clockwise the signal is subtracted from the output sum with increasing amount. Turning the knob clockwise the signal is added to the output sum with increasing amount. The output control works in the same way, i.e. the resulting output signal can be additionally attenuated and/or inverted. The module is used in the first place to mix control voltages (e.g. ADSR, LFO). It can be used to mix audio signals too but there is no difference between adding and subtracting audio signals unless they have a fixed phase relationship (e.g. the outputs of a VCO, or the input and output signal of a VCF). For audio signals without phase correlation there is no difference between addition and subtraction. Control In1 works as a DC offset generator (about -5V...+5V) provided that no patch cord is plugged into socket In1. If this feature is not required it can be deactivated by removing a jumper on the pc board. The voltage controlled version of a polarizer is the module A-133. Notes: The A-138d primarily is used for crossfading between two modular signals. On the other hand you can used it for inserting stompboxes or other effects into your modular system. Both the inputs and the mix output are available twice, like a mini-multiples e.g. for using the input signal also for other applications, kind of like a Thru. Crossfader: With the crossfading control CF you blend manually between the inputs In 1 and In 2. The Mute switch allows for muting one of the two signals, independent on the crossfader position. Effect insert: The signal at input In1 is emitted at the FX Send output and can be attenuated with the Atten. control because the modular system works with much higher levels. The effect unit's output is inserted to the FX Return input socket and its level can be boosted with the Amp. control. The processed signal is available at the bottom in 2 socket. Use the CF control to blend between the original signal and the effect signal and to mute switch for quick muting e.g. of the effect return signal. Notes: Module A-138m is a 4 x 4 matrix mixer with switches for unipolar/bipolar mode for each column. Unipolar means that the controls work as attenuators. Bipolar means that the controls work as polarizers. In this mode the amplification is zero in the middle position of the corresponding control. Turning the knob counter-clockwise from the centre position the signal is subtracted from the output sum with increasing amount (i.e. negative). Turning the knob clockwise from the centre position the signal is added to the output sum with increasing amount. The module is DC-coupled and can be used for both audio and control voltage mixing. Notes: Modules A-138p/o are used to build a simple performance mixer (instead of an external stand-alone mixer). Module A-138p is the 4-fold input module, A-138o is the output module that can be combined with one or more A-138p. Notes: Modules A-138p/o are used to build a simple performance mixer (instead of an external stand-alone mixer). Module A-138p is the 4-fold input module, A-138o is the output module that can be combined with one or more A-138p, or A-135-A/B modules. Notes: A-138s is a simple but useful 4-in-2 mixing tool. It has four inputs available. Each input is equipped with an attenuator (Level) and a panning control that is used to distribute the signal to the left and right output. Beyond stereo mixing it is equally suited to create variable parallel routings. For example: Any of the four inputs may be routed in variable intensity to feed two filters. You may regard the A-138s as a smaller version of the A-138m Matrix Mixer. Inputs and outputs are DC coupled, i.e. the module can be used for the mixing of control signals too. Notes: Module A-138u is a simple, low-cost mixer with two units. Each unit is equipped with three inputs and one output. The upper unit has for each input a trimming potentiometer available that works as attenuator and allows to adjust the amplification in the range 0...+1. In the lower unit only the third input is equipped with such an attenuator. The factory setting is amplification = 1 for all inputs. The output of the upper unit is normalled to the first input of the lower unit. That way the module can be used also as a mixer with five inputs: for this the inputs 1, 2 and 3 of the upper unit and the inputs 2 and 3 of the lower unit are used. The sum output for all five signals is then the output of the lower unit. As soon as a plug is inserted into input 1 of the lower unit the module becomes a dual 3-in-1 mixer again. Inputs and Outputs are DC-coupled, i.e. audio and control signals can be mixed. Notes: Module A-140 is an envelope generator, and, since it puts out control voltages, counts as one of the modulation devices in a modular system. As soon as the gate input receives sufficient voltage, the ADSR generates a variable voltage, changing in time, called an envelope. This varying voltage is output in normal (positive) and inverted form, and can be used, eg. for voltage controlled modulation of a VCO, VCF, or VCA, or for processing other modules' inputs and outputs. The shape of the envelope is governed by four parameters: Attack, Decay, Sustain and Release. The envelope is started (triggered) by a gate signal either from the INT.GATE voltage on the system bus, or, if a signal is put into it, from the gate input socket. The envelope can also be re-triggered, i.e. start from scratch again, each time a trigger signal is sensed at the Retrig. input socket, when the gate is still open. Module A-140 has available a three-position toggle switch to select one of three time ranges. The envelope duration ranges from about 50us (microseconds) up to several minutes. In combination with the Comparator module A-167 a free-running "ADSR-LFO" can be realized.